Summer means barbecue season for many in warmer climates. However, traditional outdoor picnic foods do hold some health hazards you need to be aware of. All food should be kept refrigerated or on ice until it is ready to be grilled or served. This is especially important for foods that contain mayonnaise. Wash your hands and cooking and serving utensils in warm soapy water before beginning to prepare the meal. Use a new platter for cooked foods. Put the platter used to transport raw food directly into the warm soapy wash water once it is empty. Always cook meats thoroughly. Never partially grill foods intending to finish cooking them later, because harmful bacteria may grow. After taking cooked meat and poultry off the grill, let it sit for 5 minutes before serving. The temperature will even out and meat juices will settle. This means when you cut into the meat, it will be moist and tender. 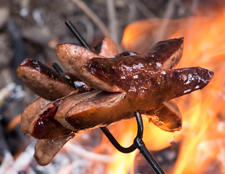 One potential health risk raised by grilling is HCAs. HCAs (heterocyclic amines) are chemicals formed in muscle meats when they are cooked over high temperatures, such as on a grill. These chemicals tend to form the longer meat is cooked, when it gets charred, or when it is exposed to smoke from fat drippings. Research suggests that HCAs damage DNA, and may encourage the growth of tumors in the colon, breast, prostate and lymph systems. To learn more about HCAs, please click this link: www.cancer.gov/about-cancer/causes-prevention/risk/diet/cooked-meats-fact-sheet. Remove visible fat to prevent drips and flare-ups. Cook smaller leaner portions of meat. These take less time to cook, and produce less smoke. You can also pre-cook meats in the microwave for 2 minutes to reduce grilling time. The pre-cooked meat will release some of its juices, which should be discarded. Then immediately cook the meat on the preheated grill. If you use a charcoal grill, cook the food on the center of the grate but push the coals to the sides for indirect heat. Grilling seafoods, vegetables or fruits does not seem to form HCAs. If you are making mixed veggie and meat kebabs, cook each ingredient on separate skewers to avoid cross-contamination. You can grill bite-sized chunks of tomatoes, onions, mushrooms, zucchini and peppers for a delightful dose of healthy ingredients. Sample a whole grain salad with additional beans or quinoa instead of a pasta salad with mayo. Enjoy coleslaw with light dressing instead of a traditional potato salad. Eat a grilled sweet potato instead of a baked potato with gobs of toppings. Serve slices of tomato and avocado drizzled with a mix of olive oil and vinegar instead of nutrition-deficient iceberg lettuce drowned in unhealthy full-fat ranch dressing.